Apple's new Retina iMacs, released last Thursday, have been showing up in Geekbench benchmarks, giving us a look at how the new machine's performance compares to the non-Retina iMacs released in 2013 and still being sold. 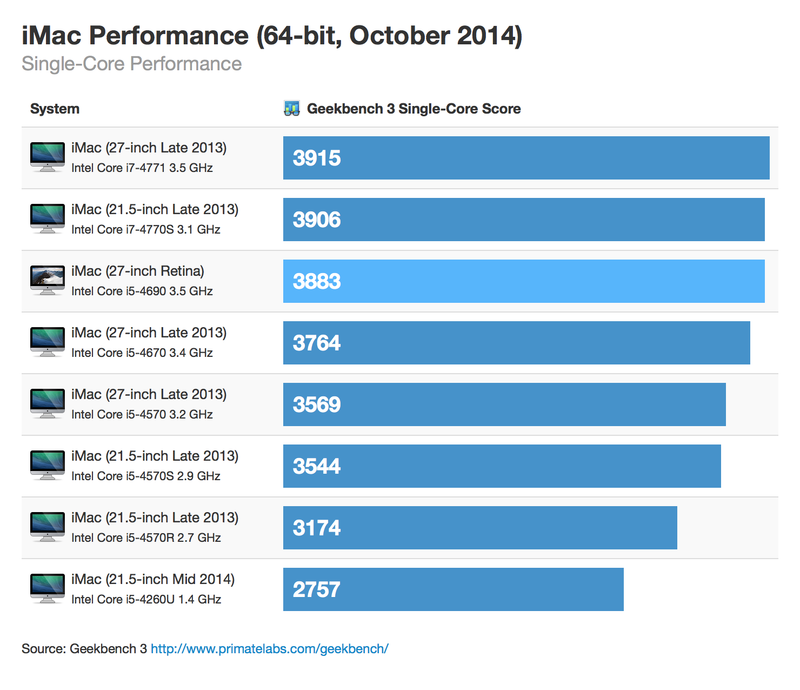 A Geekbench 3 result for the base 3.5GHz Core i5 Retina iMac has been shared by John Poole of Primate Labs, displaying just slight performance increases over the 3.4GHz Core i5 model used in the late 2013 iMac. The 4.0GHz Core i7 Retina iMac has yet to be benchmarked, but should see performance that exceeds that of existing Core i7 iMacs due to its faster processor. In both single-core and multi-core performance, the new Retina iMac offered moderately faster speeds, which is unsurprising as the machines continue to use Haswell processors that have been clocked slightly higher. More significant performance boosts in the iMac won't be seen until 2015, when Intel's Broadwell chips become available. Compared to the 2013 Mac Pro lineup, the Retina iMac offers faster single-core performance, but all 2013 Mac Pro models beat out the iMac when it comes to multi-core performance. Results for the Core i7 iMacs are expected to be similar, but according to Poole, the higher-end Retina iMac may be faster than the 4-core Mac Pro. Though the new iMac continues to use Haswell processors, its claim to fame is its Retina 5K display, which has an impressive resolution of 5120 x 2880, and its reasonable price, which starts at just $2,499. Apple's new Retina iMacs are available for purchase from the online Apple Store, with new orders shipping out in 5 to 7 days. Given the requirements to power the 5K display, I'd say that even a slight performance bump over the non-retina models is a bonus at this point. As much as I like the progress Apple makes on their line-ups, you get the feeling that this isn't a compelling purchase. I feel most compelled to buy from Apple after a new tech is integrated a year and they add the raw horsepower. So, that was the late 2013 MacBook Pro Retina, not the first model. For iMac, this model version would be "early adopter" friendly, but for practical purposes, wait for the next iteration in 2015 or beyond. It seems like many just cannot resist the temptation to complain. This refresh was not a performance upgrade. It was a display and/or graphics performance upgrade. When there's new processors that do better, Apple will update the MacBooks as well. I'm much more interested in how that 290x manages all those pixels. Broadwell is about battery life, it's not much faster than Haswell. My major concern is that this first generation of Retina iMac ends up being like the iPad 3 - underpowered and replaced quickly. There is a good chance for that scenario to play out here given what we know about forthcoming Intel processors. I usually do not jump on the "wait for rev 2" bandwagon, but in this case it is likely a good idea. What's the point of comparing 2014 i5 iMac to 2013 i7? 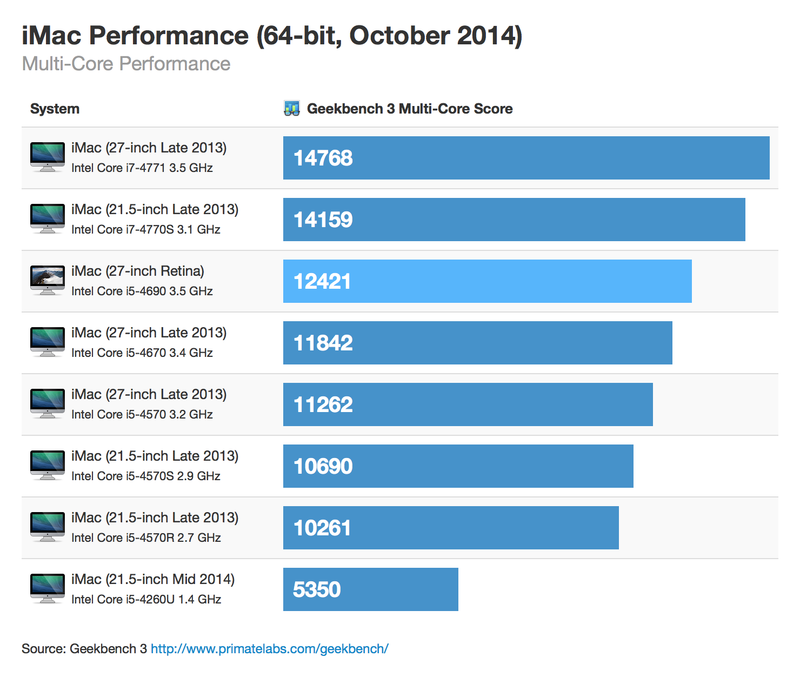 2014 i7 iMac is a lot faster then 2013 i7 iMac. 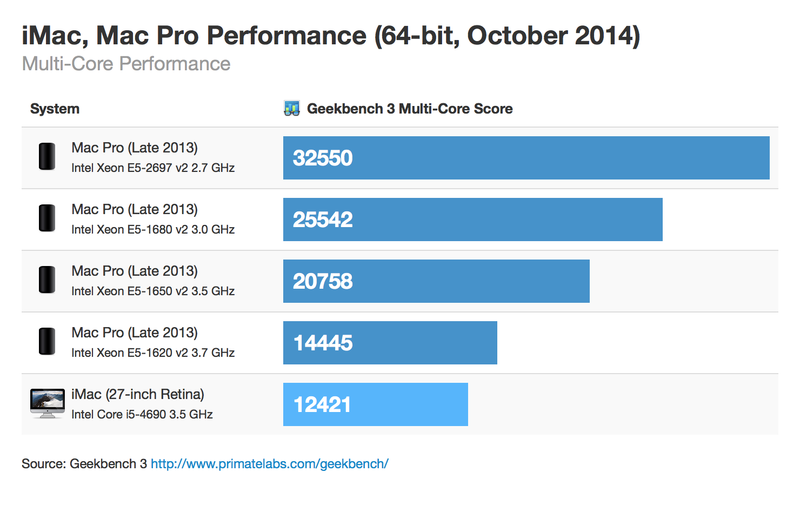 Would at least make sense to include stats for the 2014 i7 iMac as well. People will tend to miss the part that it is the i5 only and start thinking the retina iMac is slower then the 2013 iMacs. the new imac is so useless. now its not even possible to play games with the highest specced imac. simple impossible to play native. Well that's a sweepingly inaccurate statement without even getting into the fact that there are other uses than playing games. despite the fact that all slimmed down imac displays are yellowish and have very serious ghosting. you can easily play games at 1440p like before. So what's wrong?